Little Goblins Ten, co-author Pamela Jane’s Halloween book for children, has been receiving rave reviews but there are no kitties in this spooky retelling of the classic rhyme Over in the Meadow. But, kitty-lovers take heart! The Christmas sequel, Little Elfie One will be out from Harper in 2015 – and there will be kitties in it – ten to be exact! 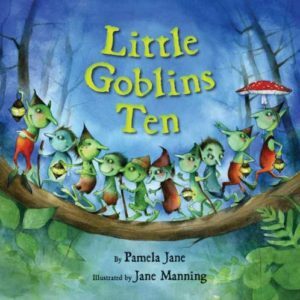 Like Goblins, Elfie will be illustrated by NY Times best-selling illustrator, Jane Manning. In the meantime, enjoy Goblins!